For the first six years of his life Matteo lives quietly in a small house in the middle of the poppy fields. His only companion is Celia, who cooks up at the Big House. She cares for and loves Matt and he cannot help thinking of her as his mother, even though she tells him not to call her "Mama." Then three children from the house discover Matt and everything changes. After Matt hurts himself the children take him to the Big House and Matt learns that he not like everyone else. His is a "beast," an "animal;" Matt is a clone of El patron, the master of the house. Usually clones have their brains intentionally damaged when they are a fetus, but in Matt's case he was left "intact." El Patron is pleased to meet Matt and he informs his household that Matt is to be treated with kindness and respect. Though they fear and hate Matt, the people who live in the Great House refrain from outright persecution of the boy, but they make it clear that he is not wanted. And so Matt becomes a member of El patron's household. He is given a good education, and being a smart boy, he learns a great deal and becomes an excellent piano player. And yet, despite all his education, Matt does not know much about the world that he is living in. His bodyguard, Tam Lin, does his best to teach Matt what he needs to know. Matt learns over time that he is living in the home of a powerful and ruthless drug lord who rules over Opium, a strip of land which is located between Mexico to the south and America to the north. He learns too that El Patron uses people who have implants in their heads to maintain his large empire. These people, or eejits, do what they are told, have no free will, and are treated with little regard for their well being. Then, to his horror, Matt learns that El Patron, who is more than one hundred and forty years old, uses body parts from clones to keep himself alive. Matt tries to convince himself that El Patron would never use him for body parts. After all, El Patron likes Matt. He has had him educated and cared for for so many years. Would El Patron bother to do that if he was just going to harvest organs from him? Desperately Matt tries to understand what El Patron has in store for him and the more he learns about the man, the more he realizes that El Patron, and Opium itself, is steeped in evil. This futuristic tale will definitely give readers a chill as they learn more and more about the world which Nancy Farmer has created with such skill. It is a place where clones are created so that others might extend their lives, and where people are slaves, both in mind and body. It is a place where life is cheap and where true friendship and love is rare. And yet, it is also a place where good things can happen if one has the courage to fight for what one believes in. Readers will find it hard to set this book aside once they begin reading. They might be appalled by Matt's world, but they will feel compelled to find out more. Will he survive and become more than just a clone? Will he find a role for himself in the hostile world that he lives in? Superbly crafted and paced, this is a title which is thought-provoking and memorable. 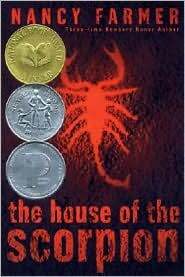 "The House of the Scorpion" was a Newbery Honor title in 2003.